As with any industry, the septic system industry uses words that may be unknown or confusing to the layperson. For example, in Texas the term “On-site Sewage Facility” (OSSF) is used as a blanket term for the systems installed most often in the state: standard and aerobic systems. So what are the differences? 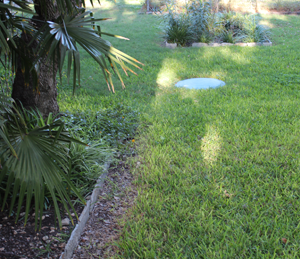 Standard systems — often referred to as simply “septic systems” — were invented first, and are simpler than their aerobic counterparts. Bacteria in the septic tank breaks down the paper and waste, then the liquids move to the soil absorption area where it is treated by the microbes in the soil. Because most of the treatment occurs in the soil of a standard/conventional absorption area, the soil must be suitable to treat the wastewater; only certain soil classes are considered suitable for soil absorption systems (here’s how we discover which kind of soil is on your property). Generally called “aerobic systems,” these systems rely heavily on free oxygen, on which the bacteria that treats the wastewater is dependent for survival. In an aerobic system there is typically a “trash tank” which breaks down the paper and waste, much like a septic tank does. But instead of the liquids going from there straight into the soil, they go into a separate aerobic treatment unit before (in most cases) being sprayed onto the lawn through spray heads. Since most of the treatment occurs within the tanks of an aerobic system, aerobic systems can usually be installed in any soil type — just another of the advantages of aerobic systems. Need help translating septic jargon? We offer free phone consultations to anyone with questions about standard or aerobic septic systems. No sales pitches, just answers — we promise.